I imagine the furniture would be a little more than uncomfortable, and the dinnerware… different. Though it does seem like it would be awesome to have. this is very awsome! Really want to build a 3D printer of some sort. Ive got loads of stepper from intelligent lighting fixtures but no idea hole to control them simply, other than using the DMX board in the light, any ideas? @lowlysoundtech Yep i have a couple of darlington arrays after crossing some wires on flying leads! Steppers are mostly 4 wire some are six, they came from 1 Genius Motor Spot, 1 showtech polar scan and the other one i cant remember. The website at http://www.blueprintmagazine.co.uk contains elements from the site iasitvlife.ro, which appears to host malware – software that can hurt your computer or otherwise operate without your consent. Just visiting a site that contains malware can infect your computer. Nice, Chrome throws a malicious site warning when I attempt to load it. When are people going to learn that advertising networks are a huge security risk? @groovenstien – the 4 wire is more than likely a 2 coil motor and u’ll need an H-Bridge, the 6 wire could be 2 coil, but with separate power ins. Here’s a great page with lots of examples of circuits and even some code for various microcontrollers. not sure why they would use something like this to make fluid, sinuous objects. kinda’ defeats the point of having such precision. Interesting idea – using this to build structures on the moon. Kind of makes sense, since doing manual labor on the moon would be pretty tough. It would have to be proven to be pretty sturdy though! And @walt – fluid structures make sense for this kind of device, since they are more difficult to do with traditional methods. Anyone can make a rectangular shed, but the benefit of these devices is that they can make more interesting shapes! Hey, i just realized – since this guy is using sand as his base medium – what about using a laser to fuse the sand into glass? That is probably not as easy as it sounds i guess, or else we’d have seen it… right? @Taylor — google “selective laser sintering” (SLS). @tehgringe – I got some 12v steppers from a local surplus shop here in Chicago, but if I do make a legit reprap, I’d rather get brand new ones. I love stuff like this, but would rather see them work with standard cement rather than special epoxies which are more likely to be expensive. Also, as far a moon structured go, I tend to like the idea of inflatable, aramid (kevlar-like materials), lunar buildings/space stations. They’re massively lighter than solid construction solutions. If you need thicker walls for things like radiation shielding, you just design them with a large space between double walls and fill the space with loose lunar fill (or build them in a deep hole like an impact crater. @nave.notnilc I have no problem with them having advertisements, but they need to figure out ways to ensure those ads are not malware. It kind of defeats the purpose of having ads if no one goes to your site because your browser detects malware. @lowlysoundtech – agreed. I am really starting out in this area, so would really use this to build a working concept that would probably just about “cut cheese” – then I would begin the spending. So far my best source of parts has been from printers and scanners but these a baby ones. Forgot to mention, the inflatable buildings for lunar bases and space stations are being developed by Nasa and Bigelow Aaerospace. The most interesting, in the short term, being Bigelow’s efforts. The company’s founder is the owner/founder of one of the biggest chains of hotels in the US. His primary goal for his space station designs are to create a commercially owned and operated orbital hotel in the next few decades. He’s already launched scale sized prototypes and will be launching a full-sized prototype soon. @colecoman – any links on this, would love to research. 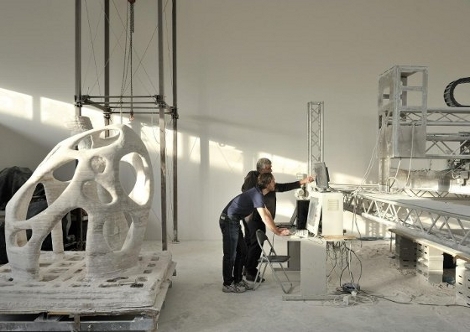 I’m curious if this will lead to stronger infrastructures of buildings – if you can print some sort of network of support beams otherwise impossible in normal structures? On a different scale… would this revolutionize how small towns/villages are built? Yeah, I’m aware of SLS, I just hadn’t seen it done with glass. Given how cheap sand is, I just kinda wondered if it could be used for SLS. I didn’t see any results really on using glass for that. One interesting offshoot of having a fullsize house/building “3D printed” is that you could also do a perfect scale-accurate dollhouse sized version without much trouble. Now that I’m thinking about it, I am wondering if you couldn’t use a refractory source of super hot air and use it to sinter the sand like a much higher temperature version of CandyFab. Ad for glass, what is currently going on is the traditional 3D printing with an organic binder mixed with the glass powder (think powdered sugar/cornstarch etc) – the liquid ink makes the binder “glue” the glass particles together. Then the item is removed from the printer and fired in a kiln to fuse it. The biggest hurdle is slumping and the ~25% shrinkage that occurs (which can be catered for, but needs research to fine tune). and they have an open source approach to the materials and research! yay! The various Solid Print tech paths all have their situational Pro/Con points. Scaling factors interacting differently for material/technology choices will make some projects truly Non-Trivial to design. That is, till we climb a horridly non linear learning curve. The path from RepStrap to printing whole houses will be damned interesting. And likely potentially disruptive to several economic niches. A formless curb caster can make a house from concrete slurry cast into stacked “Rings” right now with only minor hacking of the gear. I’d settle for spraycrete over robotically laser welded rebar today. @AskJacob thanks for that link, very intersting and not quite what I expected. google crome didnt like the link to the blueprint webpage. Said it contained malware and the such. Anyone else get that? I could be way off here, but, regarding the SLS idea…..
can you fire a laser in space or in an atmosphere with no air? Does it need oxygen or nitrogen to burn? their http://www.d-shape.com/ totally sounds like http://rockprinter.com/ to me, a mention of it would have been nice, I guess. Only I think they were using a large 6 axis robot with a spraying head. @lowlysoundtech : printing furniture is actually a very good idea. This is the first time I write about an actually possibly profitable production for a 3D printing machine : it can be customized a lot, doesn’t need much articulated part neither various different materials. Is there a material that is printable and sturdy enough for this usage ? @James: thanks for that link, I was digging through all my bookmarks/history to find it. I think that technology holds more promise for architecture, as it doesn’t require you to clean up the support structure (sand) afterward. I suspect the technology mentioned in this blog post will be more useful for art than architecture. the beginning of the industrial replicator. It is amazing to see this actually happen. @grovensien – ah, I see my Google powers are failing me once again – cheers. Out of interest do you happen to have any of the model numbers/part numbers for one of the steppers you salvaged. I want to compare the datasheet for it against the stuff I have got to see if it is worth picking up some old DMX lights. @MRE – Or even better yet…. adult sized playground equipment! @lv – I’ve been playing around with Shapelock lately, which is essentially a thermoplastic with a rather low state change temperature. It’s great for prototyping and it’s rather cheap and surprisingly fun to play. Check it out. Yes, we did – and if you had read the comments you would have seen the resulting discussion.